It is most definitely coming up to the Christmas party season, and I for one love getting dressed up and being able to crack out my favourite makeup! I thought I'd do a little edit of my go-to eye palettes for Christmas parties (but also great for gifts) to give you some inspiration for any look you want to go for! Palettes are also great if you don't have much time to get ready, as all the shadows are there in one handy palette! I think probably the most talked about, popular eye palette is the Urban Decay Naked palette. Now, I have all three in the trilogy, but I picked this one as this tends to be the one I reach for most for 'night out' territory. I think it's the mix of the warm colours and rich golds that makes me go for this, and reach for my others for more daytime/summer looks. My favourite mix is Half Baked on the lid, Smog on the outer lid/transition, and Darkhorse in the crease. It goes without saying that all the shadows are super pigmented and the palette is a must for pretty much any makeup lover! My next pick is the Charlotte Tilbury Dolce Vita palette. I actually can't believe I haven't done a review of this yet because pretty much every time I go out to an event/party/clubbing, this has been what I've reached for. The mix of colours is really just beautiful and the packaging is so luxurious - making it a perfect gift (I got mine for my 18th!). My favourite colours are the bottom two, the rich gold brown is stunning in the crease and I love using the gold glitter patted onto my lid with my finger. For those of you that like to venture a bit further than golds and browns, the NARSissist palette is amazing. Unfortunately I think this was a limited edition palette earlier this year, but you can still purchase the shadows separately. If I'm totally honest, I tend to reach for my other palettes more, but I really should start using this one as the colours are so stunning and pigmented! Plus you can't beat the sleek NARS packaging. My final pick is one for anyone that can get Inglot in their country. I'm pretty sure it isn't stocked in the UK, or is just really hard to find, but I got this palette on holiday in Lanzarote. I did a little review of the palette here so you can see the exact colours I picked, but I cannot tell you just how pigmented and long lasting these shadows are! The gold colour is so original and comes out so beautifully on the lid, and I tend to use this with the brown colour in the crease for a super quick look! 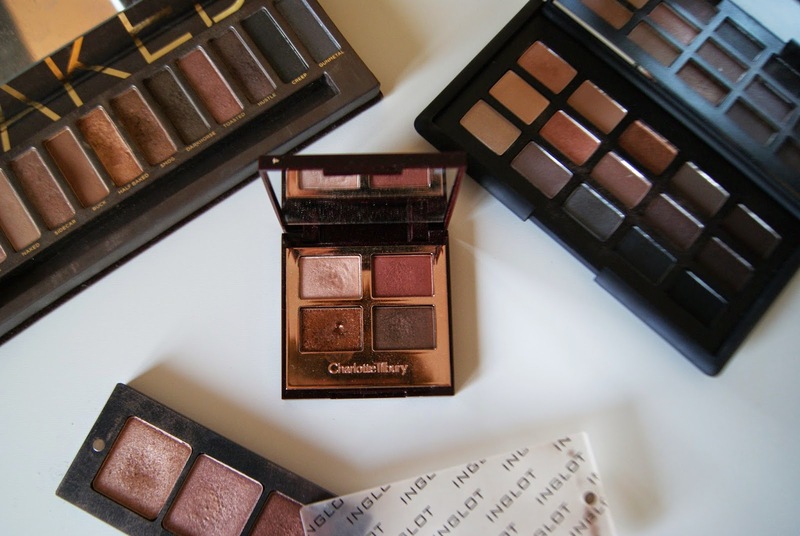 Let me know your favourite palettes for party season!